Robinson should know. 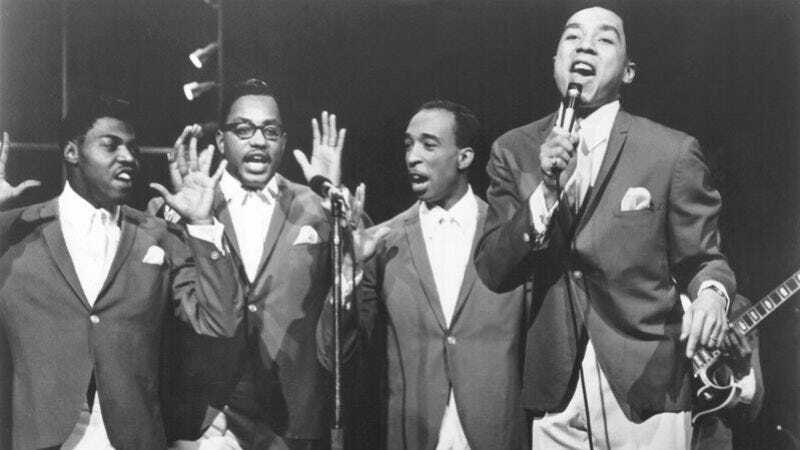 The Miracles’ frontman wasn’t just one of Motown’s most famous faces; he’s also a credited songwriter on enduring hits like “The Way You Do The Things You Do,” “My Girl,” “Get Ready,” “You Really Got A Hold On Me,” “Tears Of A Clown,” “I Second That Emotion,” and “Ain’t That Peculiar.” In 1965, Robinson and Miracles bass vocalist Warren “Pete” Moore worked with a guitar riff by their bandmate Marv Tarplin and came up with “The Tracks Of My Tears,” a catchy midtempo ballad about a man who pretends to be happy when he can’t be with the woman he loves. Though it only reached No. 16 on Billboard’s Hot 100, the song routinely makes lists of the greatest singles in pop, rock, and R&B history—including landing at No. 46 on critic Dave Marsh’s The Heart Of Rock & Soul list of the rock era’s 1,001 best. Robinson’s talents as songwriter, arranger, and producer far surpass his vocal ability… It’s the things that set up the singing that make his records memorable. With its crying lead and doo-wopping vocal background, “The Tracks Of My Tears” is a throwback to the days of R&B smoothies like Clyde McPhatter. What brings it up to date are the details: huge drums, a lovely guitar line by cowriter Marv Tarplin, sharp horns, hi-fi dynamics. The lyrics might be flimsy if their rhyme scheme weren’t so intricate. “My smile is my makeup I wear since my breakup with you” is tremendous not for what it says but because it sings. If you’re going to be the coolest crooner around, it helps to know how to craft such material. Only one guy did. Marsh is mostly saying what Robinson has said: “The Tracks Of My Tears” is wonderful because of its superior craftsmanship, not because it’s flashy. The song been covered regularly—and successfully—over the past 40 years, but most versions tend to follow the blueprint of The Miracles, from the simple opening guitar lick to the soft, sweet harmonies on the chorus. The variations below then are fairly subtle in their differences, which have to do more with production trends and personal statements than they do with reinterpreting a song that doesn’t demand many changes. Ideal cover: It’s hard to beat Aretha Franklin’s take, which has a progression that even The Miracles’ misses, adding instruments and emotional changes as it plays out. Too few covers have followed Franklin’s lead.